KVM is a virtualization solution for linux largely used in enterprise environment. It’s permits to define overlay networks scalable over public network by open virtual switch. Layer 2 networks encapsulated over udp packet, by VXLAN or GRE tunnel, enable an use efficient and versatile of network infrastructure. Docker is a open platform that permits to run applications inside containers well isolated. It’s support overlay network like KVM using native linux bridge. In this context, the article will explain how to share a overlay network between a kvm virtual machine and a docker container. The diagram above represents one overlay network shared between a virtual machine inside KVM and a docker container. The overlay network is encapsulated inside udp packet with a particular VNI (virtual network identifier). The docker-node-01 is a Centos 7.2 system, the KVM instead is a Ubuntu 16. Let’s start with Docker overlay network configuration. 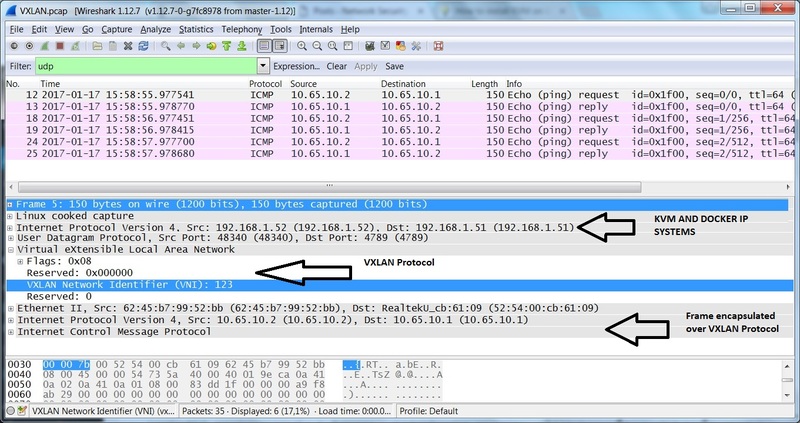 This overlay network uses vxlan as encapsulation protocol and bridge native linux. I already explained how it works in my article http://www.securityandit.com/network/inside-docker-overlay-network/. The native method of docker is useful only for overlay network between container: for integrating with overlay KVM network it’s necessary to link a virtual interface of container to a open virtual switch. Now the docker container must be created. In my laboratory I used a light container called busybox, a minimal linux distro. As you can see, one only interface, used for reach the external world. was created in the container. A new interface has been created on docker container (138: eth1) directly connected to ovs-bri switch. This command shows how the virtual interfaces are connected: the interface f12b29c5c66c4_l of the ovs-bri switch is the another pair of the virtual interface 138:eth1 inside the container. Let’s configure now the KVM system. After that, it’s needed to install virt-manager that is a GUI for managing virtual machine. The next step to do before creating the virtual machine is to define an KVM bridged network attached to virtual switch ovs-br1 already created. 4 packets transmitted, 0 received, 100% packet loss, time 2999ms. In this article I showed how is possible to integrate a KVM virtual machine with a docker container using openswitch and VXLAN protocol. This approach can be used for extendngi layer 2 networks of different data centers creating scalable and high availability infrastructure. It’s possible also to have tagged vlan and extend it by the VNI VXLAN field. Don’t hesitate to contact me for any question or suggestion.